Savage's Lavalier Microphone is a clip-on microphone for DSLRs, smart phones, camcorders, audio recorders, PCs and more. 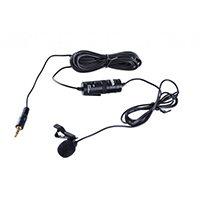 The high quality, omni-directional condenser microphone is ideal for video use. This microphone is ideal for situations when you want your voice heard but your microphone to be unnoticeable. Perfect for situations where you would like to narrate your video.